On the positive side, I can see great changes for only one month. I feel good too, and it wasn’t as difficult as I was expecting. I’ve felt moderately hungry only occasionally, and had to check myself a few times to make sure I didn’t overindulge in a couple “treat meals”, but all in all sticking to the plan was a piece of cake (figuratively speaking of course!). On the negative side, I’m a little angry at myself that I didn’t do this sooner! For years, every time I looked in the mirror I thought to myself “Ugh, I’m fat!” and remembered how I used to be. To get to this point in only 30 days makes me feel like I could’ve had it all along and not had such a poor self image this whole time. Here are a few tips that have helped me. They are all designed to stoke the flames of that burning desire for change. Knowing WHAT to do isn’t that hard, DOING IT is the real challenge! For me it is a Physique Show. Knowing that I will be on stage in front of hundreds of people is a big motivator. I remember it every time I have a moment of weakness. For you, it doesn’t have to be a fitness show, but it does need to be a goal that is important enough to give you strength. Looking good for a vacation, fitting into a pair of clothes by a certain date, and setting a family or personal photo shoot with a photographer are some ideas. You see yourself every day so incremental change may not be apparent, but comparing progress after a month will show you quite a bit. The motivation to look good for progress picture can be used as a short term goal on your path too. The boost you get from seeing the changes will keep you going for another month! I keep a picture of myself on the fridge from when I was in good shape several years ago. I’ve also used torsos of fitness models that I’d like to emulate. Every time I open that door I look at the picture and it helps me to make good decisions. Other places to post pictures or inspirational quotes are bathroom mirrors, pantry doors, in front of the toilet, at your work desk, or any other place that you tend to snack or sit at often. I bought a cheap skin fold caliper and use this website to keep track of my fat weight and lean weight. (I use both Jackson/Pollock 7 and Parrillo Caliper methods, which give slightly different readings.) As you exercise you will gain muscle, which is heavier than fat. You may not be dropping as many pounds as you’d like as you become more lean, but the amount of fat that you lose is the real key. Granted, this can be a slightly inaccurate way to measure body fat, but the actual numbers don’t matter, it is the difference month over month in the amount of fat and lean weight that will be the best judge of progress. If you’re interested where you are in comparison with other, you can use the chart below. 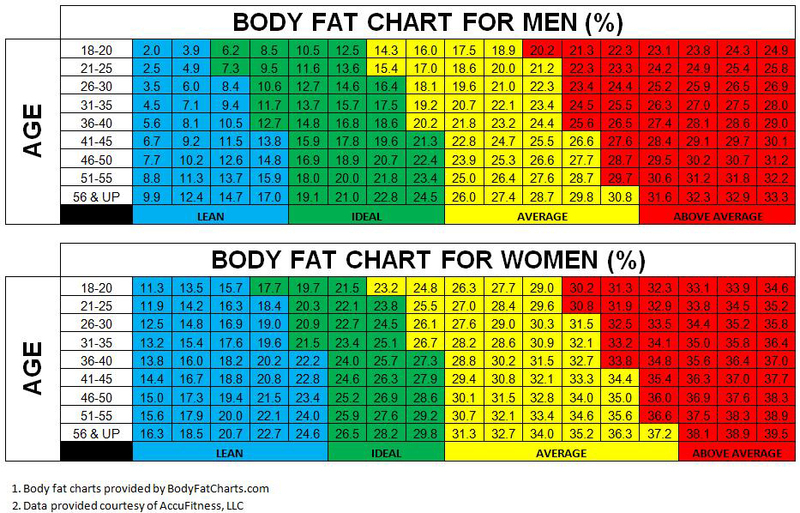 If you’re wondering, today I’m between 9.27 – 10.55% body fat. I weigh 192 with 18 – 20 pounds of fat and 172 – 174 pounds of lean weight. I’m 35 years old, so that puts me right around the first category of “lean”. Remember to follow this blog for future updates and tips!